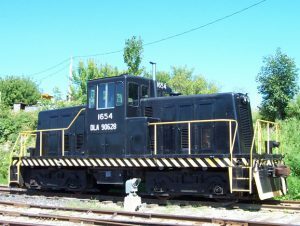 R&GV 54 (formerly 1654), a GE 80-ton switcher, was originally purchased by the U.S. Army for use at Fort Campbell, Ky., (home of the 101st Airborne Division). Later, it was turned over to the Defense Logistics Agency, renumbered DLA 90628, and assigned to Defense Distribution Depot Susquehanna in New Cumberland, Pa. It was never repainted and retained its all-black Army paint scheme after being transferred to DLA. 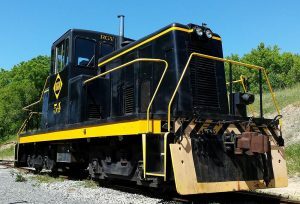 When all DLA rail operations ceased in the 1990s, some locomotives were reassigned or sold off, and the museum was fortunate to be able to purchase this from the U.S. Military via the Federal Surplus Property program. At the time of its sale in 1999, the engine was located at the Mechanicsburg, Pa., facility. Like many other military 80-tonners, this unit was rebuilt in 1989 by Chrome Locomotive. The rebuild included all new engines, electrical gear, roller bearing trucks and whisper cab. At the time the museum bought the engine, it had under 4000 post-rebuild hours on it. Unfortunately, the locomotive was not properly prepared for shipment by rail and was damaged in transit while being towed in the consist a freight train, destroying two of the four GE 747 traction motors, two gear boxes and one wheel set. After being placed in storage for two years, the locomotive was delivered to Industry on December 30, 2001. Despite the damage, our volunteers we able to rewire the locomotive to bypass the damaged traction motors, and R&GV 1654 has become one of our year-round workhorses. 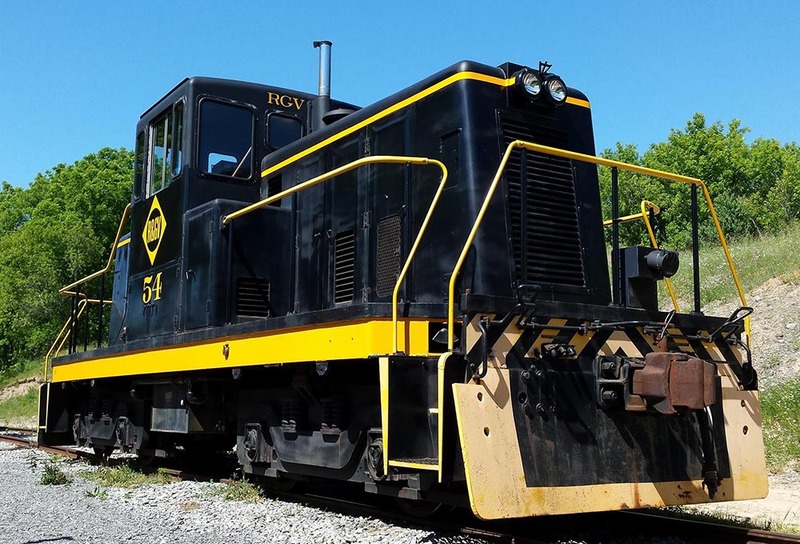 Replacement motor-axle combos have been acquired to repair and restore this locomotive to full strength. In 2016, the locomotive was transformed into Rochester & Genesee Valley Railroad No. 54, in tribute to similar switch engines operated by the Erie Railroad. We find R&GV 1654 idling in the Industry Yard during the June 2003 Rochester & Genesee Valley Railroad Museum membership meeting. After two horn blasts and to the sound of the bell, R&GV1654 lifts itself and Erie caboose #C254 out of the yard. R&GV1654 exits Scanlon’s Curve and accelerates toward Reid’s Crossing on the museum’s railroad heading timetable north. We hear the horn and bell as we cross Reid’s crossing, a farm crossing along the way, and continue to accelerate upgrade.